HONK! CRASH! BURP! CRUNCH! Look out, cavemen, or you’ll be lunch! Millions of years ago, DINOTRUX ruled the earth. These mighty part-truck, part-dino demolition dynamos rumbled, plowed and bulldozed their way through the centuries. 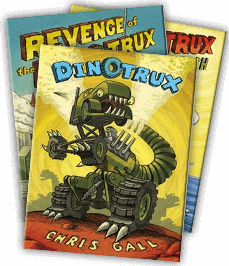 Chris Gall guides you on a safari through the wild world of these mechanical monsters of prehistoric times, from the nosy Craneosaurus and the mega-hungry Garbageadon to the big bully of the jungle, Tyrannosaurus Trux!